Balanced to perfection and ready to sail through the air with ease. This three-piece throwing set is constructed from stainless steel with unique wrapped grips and open hole pommels. Includes a durable nylon sheath to hold all three throwers. Each is 5 1/8" overall. These were a lot smaller then I expected, but they work. they have a nice weight, and throw nicely. the sheath it comes with is kinda cheap, but for the price, who cares! If you are looking for a couple of cheap throwers then these are for you. personally I would like bigger Kunai, but thats just me. All in all a very nice buy. The edges come unsharpened but it is pretty good for throwing. 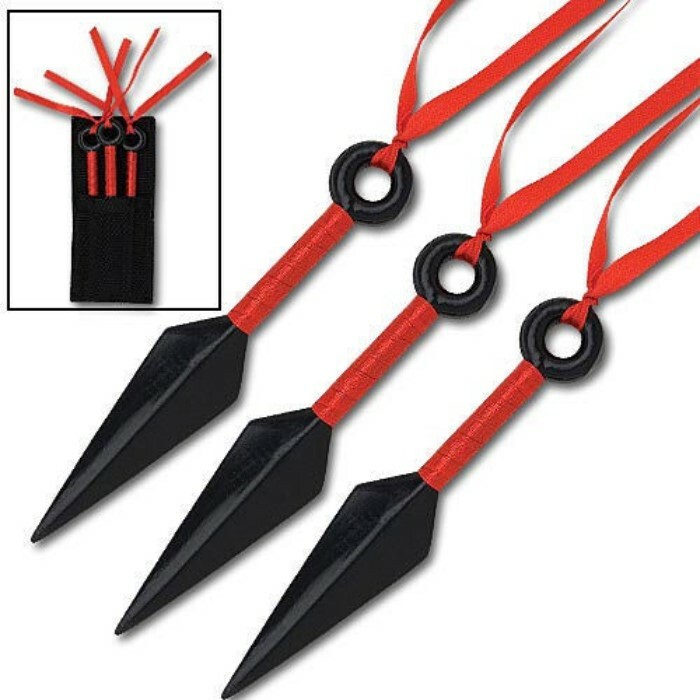 If you want heavy small kunai knives then get these. P.S. Be careful what you throw them at they can bend VERY easily. these are awesome! theyre small, thick, and very pointy, but the sides are not sharo at all but the point is so sharp you dont have to worry about the sides but besides that an exellent buy, i reccomend this to anyone especially anime fans. They are really neat little knives. Takes some getting use to as far as throwing. they need sharpening, but besides that they are fine. Not a bad product, though I do enjoy the bigger kunai knives a little more, but these help for helping younger students on how to throw them. Though they weren't completely sharp, I do admit they did stick into a target quite well.